Capturing and sharing of local content and keeping within the need of the community is an essential step towards people's participation in the developmental process. Information Communication Technologies have tremendous potential to preserve and share indigenous knowledge, which can enhance people's opportunities and be a major source of empowerment - especially for the socially and economically backward. This is an approach paper focussed on the process of socio-economic empowerment of rural communities by integrating responsive and localised Information Communication Technologies in their lives. The methodology of "lab to land" adopted by the ICT R&T Centre is well accepted by the farmers and women who are using ECKO successfully, has been explained elaborately and can be replicated elsewhere by the proponents of the telecentre's approach. Issues of learning, challenges faced and the edge that technology has over other community based management systems have also been highlighted as key learning's for initiatives that propose to take technology to the people. Information sharing and exchange as an ongoing process is the key to sustainable development at the grassroot level. This is largely achieved by encouraging a participatory approach among people and raising their awareness of the different activities within the community. The emergence of Information Communication Technology and access to electronic media has led to new possibilities in development and dissemination of information. Technology plays a vital role in development. But unfortunately, it is the rich that enjoy the benefits of technology. Some societies and some sections of society, advance faster than others and are categorized as the 'haves' and 'have-nots' depending upon their access to resources and their standard of living. This inequity is commonly known as the digital divide. Digital divide is not only limited to the availability and access to technology, but also concerns the issue of adaptability of technology to respond to the needs of diverse societies and people across the world. The digital divide brings problems for developing countries and cultural factors, local needs and language barriers compound these. ICTs for Development have emerged as ray of hope for those who were until now devoid of all the benefits of computer technology. It can have a dramatic impact on achieving specific social and economic development goals as well as play a key role in the broader national development. The real benefits lie not in the provision of technology per se, but rather in its application to create powerful social and economic networks by dramatically improving communication and the exchange of information. ICTs are already being used effectively to directly address development goals. ICTs promise a society where there is free and faster exchange of information. They allow information to be transferred across distance without face-to-face contact. ICT innovations in one sector will lead to development in other sectors too as the process of development is interlinked and interconnected . The power of ICTs has reached the villages signaling a new dawn of an easier and faster communication access for the rural people (1). Rural Knowledge Connectivity is a new participatory interactive communication process fostered by putting rural communities themselves "in the driving seat" with facilitators taking the passenger seats. 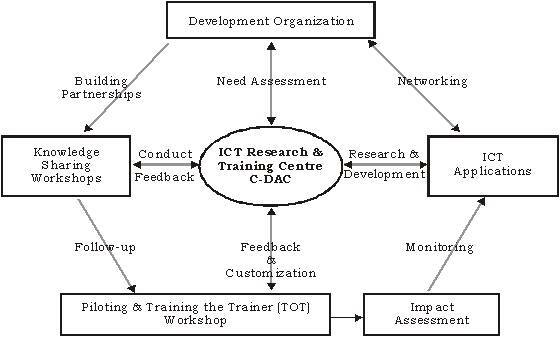 ICT Research and Training Centre (2) of Development Gateway Foundation (3) at CDAC Bangalore adopts a holistic and seamless approach in translating enabled technologies into usable products. It identifies needs and requirements, carries out applied research and development, adapts, customizes and /or localizes suitable existing ICT solutions, pilots developed solutions, establishes support mechanisms for information dissemination and designs and delivers specialized training programs to enable use of solutions. Recognizing the role of civil society and public sector institutions in providing health, education, agriculture and livelihood services to the rural poor, a multi-stakeholder strategy has been adopted. We have reached out to over 100 organisations across the country through our presentations and demonstrations at individual institutions locations and at national and international conferences. Most organizations evinced interest in deploying one or the other applications. The Centre, though, was of the opinion that it was necessary for the interested organizations get hands on exposure to the applications of their interest so that they could assess the usability of the applications, be gain confidence about the potential of the ICTs in catalyzing rural development and make a judicious decision about deployment of applications at their project locations. The opportunity to interact with the activists would also provide the technology development team at the Centre with an opportunity to understand grassroots issues. This learning is critical for developing responsive and usable applications for a developing country like India. It was decided, therefore, to organize a series of workshops focusing on the theme of "Responding to the Needs of Rural India". 80 representatives from 36 organizations (government and non government) from 10 different states participated in four workshops conducted in the early 2005. Each workshop was customized in keeping with the interest of the participating organizations and the computer proficiency of the participants. Although sessions in most of the workshops were conducted in English but local languages were used extensively to ensure that each participant could participate effectively. Some workshops were also conducted exclusively in the local language at the request of the participants. The workshops were an overwhelming success and based on the demand, software applications were deployed at eight locations in seven states in the country. These places are Pune and Latur in Maharashtra, Madurai in Tamilnadu, Pondichery, Eluru in Andhra Pradesh, Kutch in Gujarat, Alwar in Rajasthan and Bhubaneswar in Orissa. Although the lack of basic infrastructure such as electricity and telecommunications limit the widespread usage of ICT applications in the rural areas but the feedback so far we got from end users were very enthusiastic. ECKO (4) (Empowering Community Through Knowledge) the content management system, developed by the Centre has been deployed at all these project sites. It is a framework for building and nurturing E-communities. It provides a platform for creating, using, and sharing information among the members of e-communities. ECKO captures information from various sources and provides it to the users in an easy-to-use and understandable format. This information is then used to build knowledge repositories across various domains and would help in making useful inferences (5). ECKO has been deployed at AFARM (6), an association of Voluntary Organizations in Marathwada region of Maharasthra on pilot basis. Action for Agricultural Renewal in Maharashtra (AFARM) is an association of voluntary organisations working in the field of Rural Development. AFARM was born out of an acute need for an apex institution to co-ordinate efforts of voluntary organizations, in their tasks of providing drinking water and agricultural extension services to villages in drought affected Maharasthra. The main focus of AFARM's work is to assist and strengthen the capacity of voluntary organisations and their workers and through them enhance the effectiveness of the voluntary sector. AFARM today provides a forum for interaction amongst its members, and for interaction between its members and other funding and developmental organisations including the Government, for all round development of society. We follow a multi-pronged strategy to realize its goal of bridging the digital divide. We actively promote the ICT solutions, deliver specialized training programs to build capacity of users to use the solutions, pilot test the solutions developed at the Centre in selected areas and critically study the usability, effectiveness and impact of these solutions.  Need assessment : Identify the need of the community in order to develop a framework, which can be fulfilled by using ICT applications.  Organization selection: Selecting Organisations having interest in ICT sector.  Visiting organization/agencies for holding discussion and presentation : Extensive outreach to reach out to interested development organizations (Gov., NGOs, etc.) who are eager to use ICTs as a tool for development. Showcasing our products at these one to one forums to understand their interest before bringing them to a common platform.  Conducting Workshops at the Lab : Interested organizations participate for knowledge sharing and partnership building.  Deploy the suitable product: The application is deployed at the project location based on the requirement of the organisation, and hands on training of trainers (TOT) program is provided, conducted for organizational team.  Feedback, Monitoring and Evaluation: To study the effectiveness, usability of the applications and ensure that this learning feds into development of technologies and programming for deployment.  Planning strategy for effective usage of application by the rural people. Apart from AFARM functionaries associated with ICT activity, participants from different networking organizations participated in the workshop. Some participants from AFARM's Marathwada Regional Training Centre at Latur also attended this workshop and subsequently took the initiative to make use of this application for their farmers. At the Latur office, they see unique avenues in using ECKO to empower rural communities through knowledge sharing. Additionally, the AFARM head office at Pune recognizes the wide scope of this application in communicating and disseminating information among the partner organizations.  a forum for consultation amongst Government departments, agricultural and development institutions, voluntary agencies, farmers and other sections of the community.  a forum for necessary research support, to obtain information for sound planning of projects of voluntary agencies and to collect and disseminate the information to all interested parties.  a forum for promoting, maintaining and improving voluntary agencies; to provide financial or any other assistance to individuals, groups, societies, associations, institutions or voluntary agencies having similar objective as those of AFARM.  by providing information to provide technical support to voluntary agencies for soil survey, civil work and other areas of specialist inputs.  by putting training manual on technical aspects of Natural Resources, Management of voluntary agencies, Development of women, tribals and nomads, etc. with a thrust on education, economic and social development through their participation. Involvement of the community at the planning, execution and management stage of the network creates faith among the diverse sections of the community The Marathwada Regional Training Centre, Latur team of AFARM is working with the groups of farmers who have adopted Organic Farming and are practicing all its techniques. The program focuses on propagating the concept of low input agriculture practices. The program was initiated by AFARM three years ago. The farmers from the adjoining 43 villages to the AFARM Latur Center, started participating in the said program. During the same time AFARM was also recognized as Sendriya Shethi Mitra Va Margadarshak Sanstha by the Government of Maharasthra. The acknowledgment gained from the Government resulted in planned efforts in bringing the farmers in to the organic farming practices. Some of the farmers in this region were well versed with Organic Farming and were practicing it successfully through their well established traditional and indigenous knowledge. The output of these practices were positive and can be replicated in other places also. But the lack of medium for information dissemination was the main hindrance, so that other farmers who were geographically separated were not aware at all to use these good practices. ECKO provide a platform for information dissemination, where these established practices were collated and put for other's to take benefit out of it. In the beginning, the farmers who were trained in the workshop, started with uploading information in ECKO collected through the daily newspapers, periodicals & books regarding organic farming, agriculture related policies, programme implemented, exhibitions etc. After some time when they gained confidence in operating ECKO's, they shifted to uploading of the photographs related to agriculture. In the mean time, the partner organizations, who were previously only visiting ECKO for information began to upload information on ECKO to be used more effectively. AFARM's major concern was that a larger number on individuals and organisations should visit and take benefit of this site. AFARM began discussions on strategies to enhance use of ECKO. At the end of year 2005, they zeroed in on their first group of community users- the farmers participating in the organic farming program. Farmers associated with the organic farming program were coming regularly to the Regional Center to attend meetings, training programs and other activities. On an average 5000 farmers are associated with the Organic Farming Program, and 100 farmers visit the center regularly on a monthly basis for different kinds of assistance, guidance & services etc. These farmers involved in organic farming for the last three years, are now exploring markets for their products locally and globally. The farmers were introduced to the program of ECKO. In the initial stage the farmers were reluctant to use the tool, as they had no knowledge about it and also had fear in their minds. Shortly they started collecting information from ECKO on a regular basis. They also shared their experiences and requested the AFARM team to upload this information. Presently the viewers of the said site are around 5000 farmers. Their limitation is they lack access to ICT in their local areas. There are also women farmers who view this site whenever they come to the training center for trainings and workshops. In order to make the farmers familiar with the ICT tools, AFARM is planning to conduct some short trainings for them, which will raise their confidence and build their skills. The challenge before them is to increase their faith in ICT and make maximum usage of prospects prevailing in the sector for harvesting excellent profits and most updated knowledge aspiring at empowering the rural communities. The Marathwada Regional Training Centre, AFARM is also conducting a training program with Marathmoli, Maharashtra women's action net to harnessing ICTs to develop the capacity of the Mahila Vyaspeeth- Women's Forum of women led community based organizations (CBOs). This six program series has been conceptualized as a Foundational Training of Trainers program. 15 women grassroot leaders from 3 districts of Marathwada are participating in the program, which is now in its final leg. The women have built skills not only in using programs like word processing and paint but have also become proficient in sending and receiving mail. AFARM utilised BharateeyaOO, the local language open source based office suite in Marathi developed at ICT R &T, CDAC to train the women in the basic computing skills. AFARM has also used the closed group communication program of ECKO in opening email accounts for the participants. The Centre has also developed a customized version of ECKO responding to the specific concerns of women's organizations. Participants will be trained to use this customized version of to upload data in the final session in November 2006. It is proposed that the in the second phase staring 2007, this training program will be conducted at the village level with the current participants leading as trainers. The success of the program can be measured from this indicator of confidence that the participants have gained in assuming leadership to upscale the program at the grassroots level. AFARM is now looking for financial, technical and capital support to take this program to the villages. Voluntary Organisations associated with the AFARM were in need of committed, well-educated and experienced candidates for their organisations. Students looking for job opportunities in the developmental sector were also approaching AFARM for it. Being the interface for both the requirements, AFARM decided to take one step further in using ICT applications towards building the careers of the unemployed youth. They have begun uploading resumes of candidates interested in working with the voluntary organizations while using one of the services of ECKO. The associated members (Voluntary Organisations) of the AFARM, after viewing the resume of the applicants from ECKO call suitable candidates for the interviews and finally make their selection.  It is very important to draw specific requirements at the community level and not from individuals or individual cases.  The usability study should be taken up right from the requirement gathering stage and it should be prepared for design changes for necessary adaptation at any stage in the operations.  Keep the system quite open and make sure the systems helps flow more money into the process than flowing out of it. This is very essential to ensure accelerated sustainability of the systems.  It is very essential to draw experts (skilled resources) from the local community so that the problems and issues are well understood during the usage of the system and execution of the project. It may be a very good idea to build such team in the locality during the initial stages of the project so that the team could be a part of the over all project.  We should empower the local community with all the tools and skills at the user level so that they themselves will be able to find solutions to the problems encountered during the operation and usage of the system. This is extremely important for the ownership of the system by the community. This makes the system more and more user friendly.  Handholding: One of the challenges with adoption of ICT application by rural people is the lack of effective training, which hampers the handholding. We are committed to the goal of empowering poor, illiterate and rural communities through usage of the ICT solutions developed. Through our programs like workshops and trainings, we ensure local capacity building such that the community can realize the potential of technology.  Localization: The access to information must be available in the language, which is comfortable to the public user, generally the local language. The failure of most ICT's applications is due to the lack of support in local languages. To address this problem the applications we have developed, facilitate local initiatives for local content in local language with local language interface. T he accessibility of the ECKO application in local language provides the poor rural populations to access regional and global markets and thus provides an opportunity to advance their lives. It also enables them to generate information that respects their cultural idiom and responds to their practical needs. The availability of the content management system ECKO in their regional language, Marathi, has played a major role in adoption of ICTs by AFARM users.  Multi-stakeholder Partnership: To meet the development challenges, we need a partnership of government agencies, donor agencies, international organisations, private sector, research organisations and NGOs for sharing knowledge for mutual learning and joint action. The Centre emphasizes multi-stakeholder partnerships to ensure effective and optimum availability and sharing of skills, capability, managerial and organizational resources to fulfill the objective of bridging the digital divide, poverty alleviation and sustainable development. ECKO is being used by the end user with the help of Government and Non-Government Organisations who provide the vital link to the local community and play a key role in community participation for the project.  Sustainability: Envisaging the sustainable model, a cost pattern is also designed so that the kiosk operators/knowledge centre volunteers can sustain their livelihood by providing different services to the end user. They can earn money by providing user management services featured in the ECKO application. They can also add to their income by selling space to various agencies for hosting their advertisements on the Portal. They can also provide necessary priced products like agriculture products and bullion prices. Along with it they can also charge money for providing job opportunities either from the candidate or from the Organizations. Localized, community driven content and management of application by community are the key social features of ECKO. Event driven chat system, searchable profile, message board, forum, day-to-day local, national and international news, weather forecast, market prices and well versed shopping facilities are the other features which make ECKO as a social community software. Support of localised text-to-speech, providing interface and tool for physically challenged, robust architecture to supports other already existing systems like e-governance, e-learning applications etc distinguish it from others. Its hierarchical structured for content management, regulation of content across different community and provision of easy way to customize the application according to need of the community makes it technophile.